Fall. The time of year when leaves turn shades of orange and red, brisk breezes ruffle scarves, boots are required and the smell of pumpkin wafts through the air…if you live somewhere else. Here in Vegas, fall means 80 degree weather, there are no trees to look at and the pumpkins are guarded by carnies. That doesn’t mean we can’t celebrate the autumn spirit though. Personally, this is my favorite time of year to embrace basic-ness by wearing Uggs (with shorts…I know, I know, judge away), eating everything pumpkin and getting caught up in major Pinterest envy. The daunting task of pumpkin carving begins to weigh down on me. I remember Charlie Brown and the Great Pumpkin. I imagine myself as Linus, full of disappointment and sadness. I slowly descend into the five stages of grief. Stage 1: Denial. 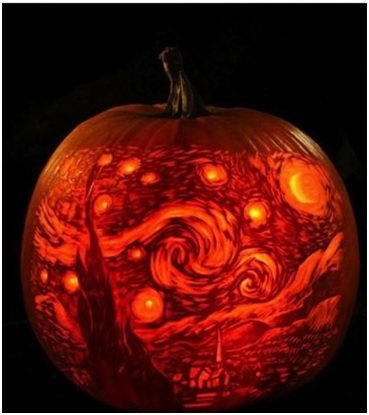 No one can make pumpkins like this. They must be created in Photoshop and posted to make the rest of us doubt our skills. It simply isn’t real. Stage 2: Anger. 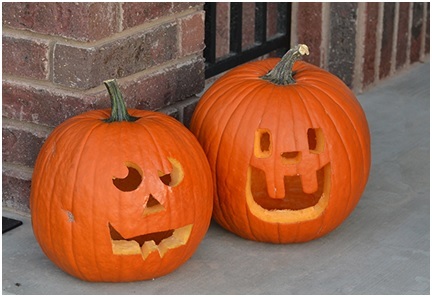 I am so mad about these pumpkins! I’m not carving them this year! It isn’t worth it! No one likes pumpkins anyway. Stage 4: Depression. I’ll never be an adequate pumpkin carver. *tears begin to fall* It’s time to just give up. I am obviously not crafty enough to create these memories with my family. I’m crawling into bed until Christmas. Stage 5: Acceptance. Buys a bunch of candy, makes an ugly pumpkin and then laughs when it begins to rot two days later. My 6-year-old lost interest half-way through anyway. So, as you can see, pumpkin carving is the first emotional roller coaster of the holiday season. Luckily, post Jack-o-Lantern PTSD, we get all the pumpkin pie, candy and treats that we want as we prepare for Thanksgiving. Which brings me to my next question…does anyone actually know how to cook a whole turkey? !